Jan, from JW Blooms has been a gem and agreed to say a few words on locally grown flowers for weddings. Many thanks to her from all at Higgledy…. Hello, Higgledy readers! Ben has very kindly asked me to write something about using locally grown flowers for a wedding. I’m not sure if the Higgledy boys have employed their undoubtedly honed feminine sides in doing weddings yet but as “boutique flower farmers” (copyright Ben), it surely won’t be long. 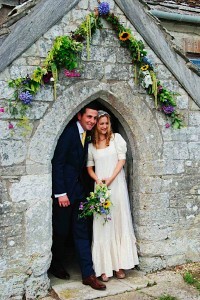 When I set up JW Blooms three years ago on a tiny patch of land in Somerset, I hadn’t set out to do weddings but I kept getting asked and soon realised that lots of brides were after sustainably and ethically grown flowers for their big day. And even if their prime motive wasn’t the way the flowers were grown, lots more really wanted the relaxed country style that comes with them. Whatever your style, taste or budget, British flowers can fit the bill. You may have to be slightly more relaxed about your choices – I can’t provide hydrangeas in May or lilac in September – but what I can guarantee is that your flowers will be beautiful, sweet-smelling, sumptuous and guilt-free! So if you’re getting married and are in the West Country, give me a call on 01823 660870, or if you’re in the South East, give Ben and the Higgledy team a nudge. Let’s get those churches filled with the flowers they, and you, deserve! Check out Jan’s fab blog here! Bless you Jan. Loving the idea of tying with clematis and honeysuckle….